Recommended to: Women who are looking for something uplifting and funny to read. Patricia V. Davis may be the first to tell you she's an expert in failed relationships. But ask any of the readers who helped a post on her advice blog go viral, and they'll say that whether you're wide-eyed twenty-something dreamer, the world's grooviest grandma, or something in between, there's no one better able to help you on your way to becoming a True Diva! I'm not usually big on reading books from the self-help genre. 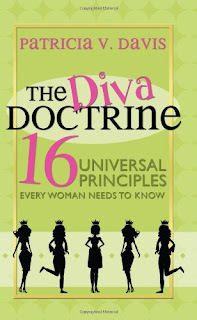 However when I saw the cover for The Diva Doctrine I'm going to admit that I was really intrigued! 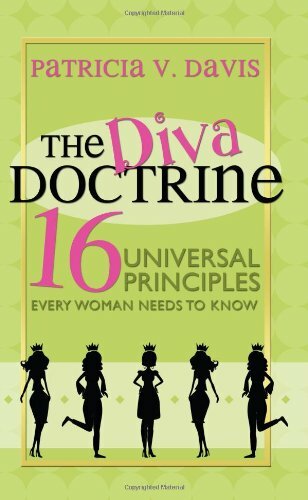 The simple fact that there were exactly 16 universal principles to follow in order to become a diva made me pretty curious. What would they be? So, I snuggled into bed and opened up the book. The first chapter just blew me away and I was drawn in from there. In this chapter Patricia V. Davis actually explains where her inspiration for this book came from, and points out a lot of parts of her life where she's learned things she wants to share with other women. As the book progresses, she names and outlines each of her universal principles. I really loved her wisdom, and her tongue in cheek jokes. Her writing style is extremely comfortable, like she is sitting there right in front of you to have a conversation. In fact I'm pretty sure that I giggled more than a few times while reading! Oh and lest you think that you're being drawn into a book about how to be an obnoxious woman, let me reassure you, Patricia lays out the fine line between diva and Diva! As for the principles themselves, I couldn't agree more! Each chapter shares something that, honestly, seems like common sense. However while I was reading I stopped to think about how often I had actually considered any of these things. For instance, loving yourself. Your whole self. Right down to that nose that drives you crazy, or your large behind (which yes I have). Throughout the book Patricia pulls examples from her own life, and shares her mistakes and what she learned from them. What I loved is that she doesn't seem down trodden by everything she has been through. Quite the opposite actually! She's learned to laugh a bit at it, learn from it, and share it in an effort to help other women out there avoid making the same mistakes. There's really not much else that I can say! I adored every second of reading this book and I'll be spreading it around to all of my friends and family as a recommendation! As Patricia says, we need to learn to nurture one another as women, and help each other grow. This book is a great step on the way to that! I wish that every woman would read it, because it definitely makes you think.